How does fluoride change the shape of teeth? Is fluoride an important nutrient for early pregnancy? 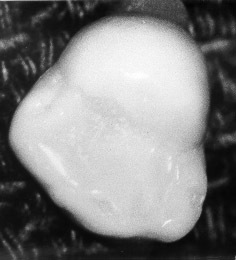 This picture from Dr. Glenn shows a very smooth molar tooth from a child whose mom took fluoride in pregnancy. Almost all of the molar teeth that form with enough fluoride are smooth (maybe not as smooth as this example, but smooth enough to protect them from cavities). Glenn FB, Glenn WD, Duncan RC. Prenatal fluoride tablet supplementation and improved molar occlusal morphology: part V. ASDC Journal of Dentistry for Children 1984;51:19-23. A common developmental defect called pits and fissures is reduced from 28% to 0%.